The Mobile Work Station® is a certified EPA 6H compliant portable limited finishing workstation. 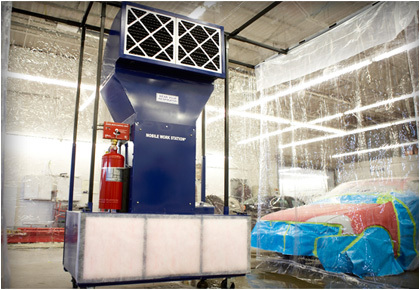 For over 25 years this unique mobile paint booth has helped our customers add capacity and productivity to their prep and paint operations. 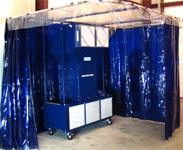 Easy to maneuver, our portable spray booth / filtration system utilizes a self-contained, non-venting recirculation design. The attached enclosure system is supported by the four locking easy-roll casters beneath the filtration system housing, enclosing and containing spray operation residues while promoting mobility and efficiency. With less than 3’ of aisle space needed it can be moved quickly and easily, enclosure and all, anywhere in your facility – ready to work. A portable booth allows you to perform your painting operations where and when they will be the most productive. The Mobile Work Station® moves to the work rather than having to move the work to the booth, reducing vehicle shuffling or the headaches of moving heavy, large, or temporarily incapacitated items for partial touch-ups or refinishing. The most versatile portable booth on the market: It works where you need it. All Mobile Work Station® models are designed to use common sized 20” x 20” filters, rather than an unconventional size with limited availability. In addition every unit has adjustable filter racks, so the combination of filters can be tailored to the operator’s unique usage conditions and customized to adjust the type and level of filtration desired. Our standard filter set features very aggressive filtration which not only removes a very high percentage of airborne particulates such as overspray (tested at 99.78% efficient), but also uses activated carbon filters to remove odors and VOCs (Volatile Organic Carbons). We feel this is the best combination of filters available for filtration of most paint spray applications. In addition to our standard filter set, we also offer alternative filter sets for optimizing filtration during particulate only work (such as sanding), metal grinding, and welding operations. Set it up, plug it in, and go to work. The Mobile Work Station® ships as a complete stand-alone system. This portable paint booth provides you instant capacity to perform limited high-quality painting and refinishing without a large fixed-position spray booth. Having the added capacity and flexibility of a portable booth can help move more work through your shop and break the paint booth bottleneck; decreasing cycle time and increasing billable jobs. Whether you’re looking to increase capacity and productivity in your automotive body shop or on your industrial shop floor, the Mobile Work Station® is the portable limited finishing workstation / booth that keeps work moving. Eliminating unnecessary waste can preserve a jobs true profit margin. 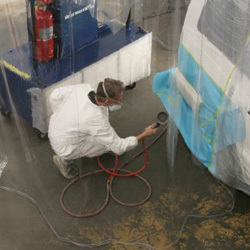 A portable paint booth can be an excellent choice if you are looking to take some of the load off your fixed unlimited spray booths by providing additional capacity for smaller jobs, as part of a shop optimization plan allowing occasional equipment reorganization, or as a stand-alone system where the type or level of work doesn’t justify the installation of a large permanent booth and air make-up system. Significant energy savings can be realized from not having to fire up large booth fans on smaller jobs. A recirculation filtration system is designed to utilize your shop’s already conditioned air and eliminate the loss of previously heated or cooled air. 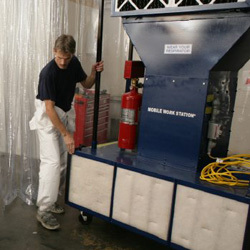 A portable paint booth can mitigate the spread of overspray, odors, and VOCs throughout your facility. This means less clean-up, can lead to longer life of surrounding equipment and reduced maintenance, and a healthier work environment for your employees. The Mobile Work Station® is perfect for adding flexibility to your finishing operations, while protecting your bottom line – better air quality, better finishes, more productive and profitable operations. American made from the 14 gauge powder coated steel used to construct the filtration housing to the heavy duty crate these units are shipped in. Every Mobile Work Station® is manufactured, tested, inspected, crated, and shipped from America’s Heartland. The Mobile Work Station® is the industry standard in reliability. We utilize maintenance free, sealed UL Listed hazardous location rated motors with direct drive fan assemblies, in which the fan impeller is connected directly to the motor shaft. This increases efficiency, which reduces energy costs and leads to extended service life, by eliminating power transmission losses experienced by less expensive belt driven fans due to the friction created by additional pulleys, bearings, and belts. It also eliminates the need for periodic tightening, alignment, and replacement of components inherent in a belt driven system; especially a portable system. The Mobile Work Station® also features a backward curved non-overloading aluminum (non-sparking) fan wheel constructed with hollow airfoil blades, and an aluminum inlet cone. The fan wheels are statically and dynamically balanced to provide higher airflow performance at less horsepower, and with minimum air noise. Model No. 5410 – This unit features an upgraded 1 ½ HP 3500 CFM motor/fan assembly, advantageous for additional air flow. By nature, or at least practical design, a portable paint booth (more accurately a paint spray booth or spray booth) will not be designed to meet all the vigorous requirements of a fixed unlimited volume spray booth; and generally will be limited in both usage and size. Thus a truer description for equipment commonly known as a portable paint booth would be a portable limited finishing workstation(1). The standard dimensions of the Mobile Work Station® can be found on the Specifications page. (1) The term Limited Finishing Workstation is found in the National Fire Protection Agency’s Standard for Spray Application Using Flammable or Combustible Materials (NFPA 33). Reduce cycle time. And turn your back log into cash in the bank. The Mobile Work Station® allows you to work anywhere in the shop. It WORKS where the WORK is! Want more information on a Portable Booth?